Having seen many of these handsome trees in bloom, we thought we would share a bit more information about these beautiful and interesting trees with our loyal followers. The Weeping Boer Bean attracts a wide variety of insects, birds and animals and is a buzzing hub of activity when in bloom. It gets its name from the brightly coloured deep red flowers which bloom from late winter into the summer months. The flowers hold copious amounts of nectar which the small petals are unable to contain thus causing the tree to seem as though it is weeping; the Greek name “brachypetala” means small petals. The irregularity of the flowering time for the Boer Bean makes this tree very valuable to the nectar feeding birds as well as monkeys and baboons as it ensures a longer feeding season. The “Boer Bean” part of the name comes from the fruit which the tree bares. It is a hard, flattened pod containing seeds and aril which is enjoyed by monkeys and birds. The seeds are edible if roasted and were used by the Afrikaners to make coffee. The seeds are low in fat and protein but high in carbohydrates making them a good food source to the Khoikhoi and the European settlers and farmers. 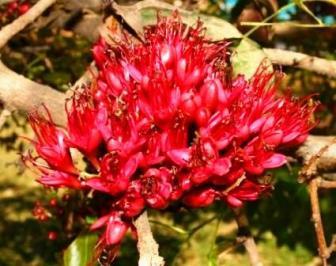 A decoction of the bark can be used to ease heartburn and hangovers while a mixture of the bark and root is used to strengthen the body and purify the blood, treat anxiety and diarrhoea. But that’s not all folks… Should you wish to dye any fabric red the bark can be used for this too! The Weeping Boer Bean is a good quality timber making termite resistant furniture. It was used by the Afrikaners to build wagons and was chiefly in demand for wagon beams. In our modern homes the wood is used for furniture and flooring blocks. What a wonderful tree the Weeping Boer Bean would be to grow in your garden at home to attract a kaleidoscope of bird and animal life!